Smoky Mountain Attractions: Take to the Sky to See the Fall - Bear Camp Cabin Rentals. How would you like to see the fall colors from 400 feet in the air? 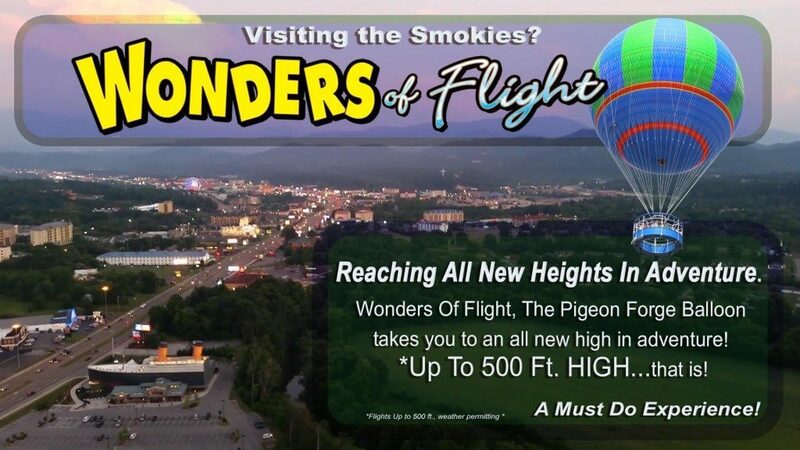 Located right around the corner from our cabins in Pigeon Forge,Wonders of Flight is a one of a kind balloon ride attraction. A spinoff of the famous WonderWorks museum, Wonders of Flight offers guests 360 degree panoramic views of the Great Smoky Mountains. Unlike typical hot air balloons, Wonders of Flight fills its giant balloon with helium. There is no need to heat this lighter-than-air gas with a noisy burner, so the Wonders of Flight balloon is completely silent and free of vibrations. Manufactured by Aerophile, the world leader in tethered gas balloons, this enormous balloon is 72 feet in diameter and can hold up to 30 guests at once. Autumn is the perfect time to experience the Wonders of Flight. From high in the air, guests will be treated to gorgeous views of the red, orange and yellow leaves that cover the Smoky Mountains. Visitors can also ride the balloon at night to get a spectacular aerial view of the downtown lights. Adult tickets cost $15.99 and tickets for children 12 and under cost $9.99. Wonders of Flight is open daily beginning at 10 am. After seeing the sights from the Wonders of Flight, you will be ready to retire to one of our cosy cabins in Pigeon Forge. Bear Camp Cabin Rentals is close to all of the best attractions, shops and restaurants in the Smokies. With incredible amenities and a convenient location, Bear Camp cabins have everything you need for an unforgettable vacation. Visit our Specials page to learn about our latest deals and promotions!